HARARE, Zimbabwe- President Mugabe took his Oath of Office August 22, 2013 before a colorful, jubilant capacity crowd comprising Zimbabweans from all walks of life, current and former African Heads of State and Government and diplomats accredited to Zimbabwe at the 60 000-seater National Sports Stadium in Harare yesterday. Heads of State and Government who attended the ceremony included presidents Jakaya Kikwete (Tanzania), Joseph Kabila (DRC), Hifikepunye Pohamba (Namibia), Armando Guebuza (Mozambique), Teodoro Obiang Nguema Mbasogo (Equatorial Guinea) and Rajkeswur Purryag (Mauritius). Zambia was represented by vice president Dr Guy Scott, South Africa by VP Kgalema Montlanthe, Malawi by VP Khumbo Kachale and Swaziland by premier Sibusiso Dlamini. Former Presidents Dr Kenneth Kaunda of Zambia, Thabo Mbeki of South Africa, Ali Hassan Mwinyi and Benjamin Mkapa of Tanzania, and Sir Ketumile Masire and Festus Mogae of Botswana were also among the dignitaries. Of the GPA partners, only Professor Arthur Mutambara turned up. Wild cheers broke out as soon as President Mugabe’s motorcade appeared on the big screen just before midday, with ululation, whistles and chants of “Gushungo!, Gushungo!’’ reaching a crescendo when the President entered the arena aboard his official army inspection truck with the First Lady by his side. They slowly did a lap of honour around the race track, saluting the crowds in the grandstands to the reverberating sound of “VaMugabe Vanogona’’ by the late Cde Elliot Manyika; before the President took his place on the saluting dais for the singing of the National Anthem led by the Army Band. Shortly afterwards, Zanu-PF National Political Commissar Cde Webster Shamu introduced African Heads of State and Government, past and present, as well as emissaries before religious leaders beginning with Reverend Andrew Wutawunashe of the Family of God, Bishop Chad Gandiya of the Anglican Church of the Province of Central Africa, Bishop Trevor Manhanga, presiding bishop of the Pentecostal Assemblies of Zimbabwe, and Bishop Johannes Ndanga of the Apostolic Christian Council of Zimbabwe dedicated proceedings. 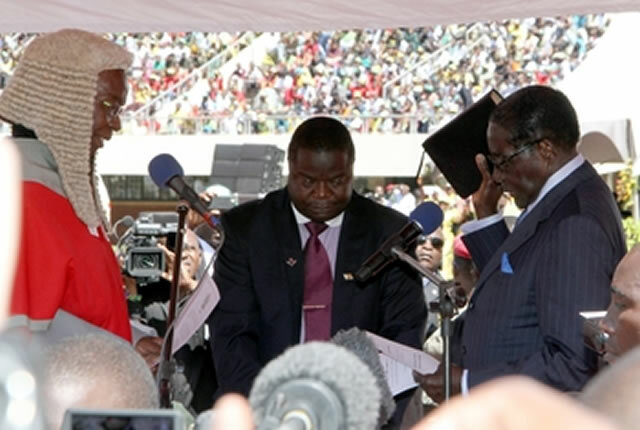 At exactly 11:40am, Cde Shamu invited Chief Justice Godfrey Chidyausiku and President-elect Cde Mugabe to the podium for the oath which the Chief Justice administered at 11:43hours. “I, Robert Gabriel Mugabe swear that I will faithfully bear true allegiance to Zimbabwe and observe the laws of Zimbabwe so help me God,” the President’s voice boomed from the public address system to loud cheers from the capacity crowd that broke into song and dance with the “Zora Butter’’ routine popularized by sungura artiste Alick Macheso moving like the Mexican wave around the grandstands. Soon after signing the oath, the President was adorned with the Sash and emblems of Office by Justice Chidyausiku. Commander of the Zimbabwe Defense Forces General Constantine Chiwenga then read out the Pledge of Allegiance on behalf of the Zimbabwe Defense Forces and congratulated the Commander-in-Chief on his resounding re-election. Although I was not fortunate enough to be born a Zimbabwean, I as a black African-American appreciate all that Robert Mugabe has stood for as he represented the Zimbabwean People. I and my family truly wish him and Zimbabwe all the success in this world and may he live another 80 years.